Turkistan (pop. 70,000), one of the most important cities along the Great Silk Road, celebrated its 1,500 anniversary in 2001. Archeological finds at a nearby hillside settlement known as Koul-tobe are dated to 500 AD. Known as Shavgar and later as Yasi until the 16th century, the town, located between the nomadic societies to the north and the agricultural communities to the south, became an important trade and religious center through the centuries, fought over by successive invaders. and by the late 1400's Tamerlane (Timur) extended his realm across an enormous region, from Syria in the west to India in the east, with Yasi near the center. It was Timur who, through the construction of a mausoleum for Kozha Akhmed Yasaui, made the city a shrine for Sufi muslims and established Kazakstan's greatest building. Work stopped upon Timur's death in 1405, and the front facade remains unfinished. Subsequently the Uzbeks reclaimed the city, but occupancy changed hands frequently between the rival clans of Kazakhs, Mongols and Timurids. 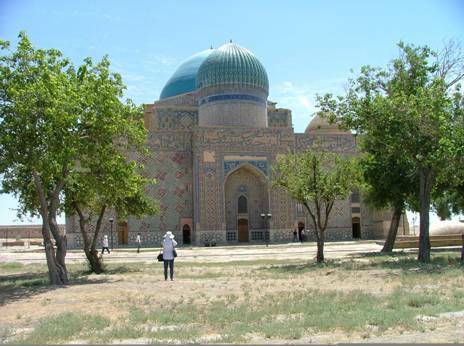 From 16th-18th century, under the new name of Turkistan, the city was the capital of the Kazakh Khanship. A century later, Russia started to take an interest in the region and subsequently extended its empire by military conquest and by railroad construction. mystic-ascetic trend in Islam, seeking to bring together various religious trends, and Khodja Akhed was the prophet. today's mausoleum) dying there in 1178. Approaching the mausoleum through extensive rose gardens, the visitor first notices an arch flanked by two round towers which forms the unfinished front face. The bricks were handed up one by one using wooden scaffolding (the wood came from West Tien Shan mountains) remains of which still protrudes today from the walls. An inscription over the entrance of the building reads: "This building has been erected by the order of the sovereign Emir Timr Gurgan. Belowed Allah...let Allah prolong his orders for centuries!" entering the principal structure, tickets are checked and a guided tour (no extra charge) is usually available (in Kazakh, Russian and good enough English). The whole structure was intended to serve many purposes: as a meeting hall, a burial vault, a mosque, library and kitchen as well as having rooms for pilgrims and staff of the "khanaka", the name given to the whole complex – a total of 35 rooms overall. Entering the central chamber , the full proportions of the building can be appreciated. Soaring 39 meters above the floor is the main dome, 18.2 meters wide. In the center of the chamber is a massive two-ton cauldron (kazan), more than 2 meters wide. Made of seven precious metals, the great vessel has relief inscriptions on the side, the middle one bears the words “Be Blessed”, the year it was made (1399) and the master builder's name. Also in this chamber are Timurian staff banners and copper candlesticks. The mosque, in the northwest corner of the complex, is the only part of the building where fragments of wall paintings survived - geometric and vegetable designs in light blue paint. Windows high in the walls let light into the space permit the visitor to see up close the mosaic wall tiles. religious texts inside the geometric designs, texts from Koran are inscribed on friezes below the domes and written in canonical hand-writing. Watch the walls for a couple of hours and you will see how the sun changes the appearance of the lines and patterns. Two other buildings warrant a visit. On a small hill to the west is the Hal-wat mosque and small museum, built underground. Here is where Yasaui is said to have committed himself to solitary meditation for the rest of his life. A 15th century restored bathhouse is the other point of interest before leaving the complex.